What days is Kinderwood Closed? Friday before Labor Day- In-Service Day for class change. When Kinderwood is closed for a holiday all regular tuition rates apply. Is tuition rates the same when a child is absent? If a child is absent for a full week for any reason, we will charge half of the regular tuition fee. If a child attends even one day, full tuition will be charged. This also includes holiday and vacations. Your child is able to sit and engage in an activity for several minutes without becoming distracted or irritable. What is your process for potty training? This must be a team process. We feel for this to be successful we must be doing the same things at home and school. Below is the schedule that we recommend. We ask that on the weekends you please try to mirror this process. Wake up immediately go to the potty. At school we will send Potty training children to the potty @ 8:30 am; 10:30am; Right before nap; 2:30am (or as soon as they wake up) & 4:30pm. Asking in between scheduled times if they did not actually potty at the scheduled time. We know that this process is time-consuming. It takes a lot of work. Some children get this process immediately and the schedule can loosen as they are having more success and are able to vocalize their potty needs. Accidents will happen, some days more than others. Do you allow cloth diapering? Parent must bring in a diaper pail with a lid for soiled cloth diapers. Parent must take soiled diapers home nightly. Parents must provide all diapering items. My child is Potty Training. What do I need to bring? How do you handle children biting others? Do you put children on time out? What things can my child NOT bring to School? What age do children bring blankets? What Curriculum does Kinderwood use? FunShine curriculums are aligned with early learning standards and guidelines across the nation. We are confident our early learning materials meet or exceed the standards set forth by states and early childhood organizations. Can you bring dessert for a child’s birthday? Yes. However, we require no nuts. In general, children should stay home if they have a fever of 100°F or above and they should not return for at least 24 hours after the last fever (without taking Tylenol or Ibuprofen). Additionally, a child should stay home if they are unable to comfortably participate, or teachers determine that they can not care for the child without compromising their ability to care for the health and safety of the other children in the group, even if their illness is not listed above. What is required that my child bring? Changing time creams or ointments. Children who are at Kinderwood before 8am will receive Breakfast. Infants are required to provide their own Breast Milk and or Formula. What Food is provided for Infants? We serve a variety of Plum Organic puree food items. Parents provide prelabeled and bottles of Infant Formula and or Breast Milk. No, We are a nut free school. Yes! All meals, even for infants, are provided by Kinderwood. 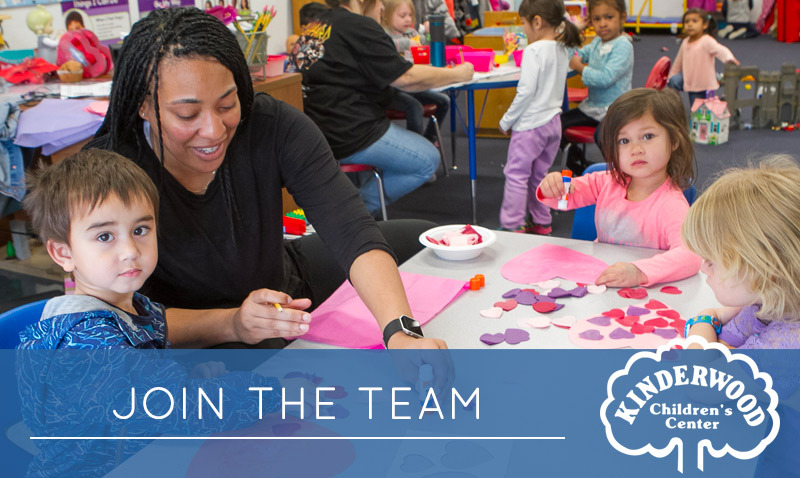 Are you looking for an exciting and rewarding career or know someone who would be a great teacher? We are always looking for Positive, creative & energetic people to join our friendly staff.